ᐅ SecuPerts Forensic System | Become a data detective! Research your computer's past life and become a data detective! Not just for those who are curious or inventive! Ideal for beginners too; it only takes a couple of clicks! The SecuPerts Forensic System contains a range of research, analysis, and backup tools, that let you become an IT detective on your own computer. Available as Download or on a USB-Stick! Become an IT detective on your own computer! The SecuPerts Forensic is really worth its weight in gold if acquaintances or even third parties have (or have had) access to your PC. You wouldn't believe what might have happened. Find out about the entire lifespan of the PCs in your possession. Launch our SecuPerts Forensic System via a DVD or USB stick and explore your computer, network etc., restore files you'd forgotten or thought you'd lost. All this is possible without any expert knowledge. Do you suspect that spyware was installed on your machine while abroad or that your Notebook, issued by a company at home, is hiding illegal monitoring software? Thanks to the forensic system, you can find and remove malware, without having to install additional software in Windows. Did your computer go astray and then was returned or did someone unauthorised manage to access it? Based on the file and browser history, you can discover which programs and documents the unauthorised user opened, the websites they surfed and if they may have accessed private data. What happens to your computer when you're not there? In a hotel room, for example? What files were deleted and how much of this can be restored? Which programs were installed and deinstalled? What searches were made or was something stolen or altered? For example, passwords, or your bank account access data? And if you happen to forget your local password – the SecuPerts Forensic System helps you here too. Does data make a formatted hard drive valuable? If you format a hard drive, only the index is deleted. Saved data continues to be available, until it is overwritten, in rather a random order. You'll be astonished at the surprises a formatted hard drive can reveal or how many supposedly deleted files remain on a hard drive that's still in operation. What does my Smart TV do online? What happens on your own network? Smart TVs, which download program information from the Internet or allow you to use Skype or surf the Internet, are certainly practical. But these devices transmit more data than required; for example, your TV viewing habits to advertisers. By using a network sniffer, you can see which services your television contacts and thereby prepare to block the unnecessary data transmission through router settings. Do I have unsecured devices on my home network? The Mirai botnet took over last year, which spread using worms on Internet webcams, DSL routers and WLAN access points. Such devices are used once and then provided with security updates. Using the Forensic System network tools, you can create an inventory of your home network and track down insecure devices. Many devices even have "Proof-ofConcept-Hacks", which allow a harmless program to be launched, for example, without testing the vulnerability. With the information you gain, you can update vulnerable devices or shut them down. If the computer is to be reset to the original state after being infected by malware, before the full deletion, taking a bit-true Image of the hard drive is often a sensible approach. In order to also save unused sectors, based on the images, it can later be proven, for example, that malware was responsible for illegal bit torrent uploads and that you did not perform these willingly. All save processes can be created in such a way that they can be used in court. Do you want to sell a PC, Notebook or hard drive? Delete your hard drive 100% and check the status of your drive (defective assemblies, impacts, etc.) so that you can prove, in the event of a complaint, that the hard drive was in good condition when sold. 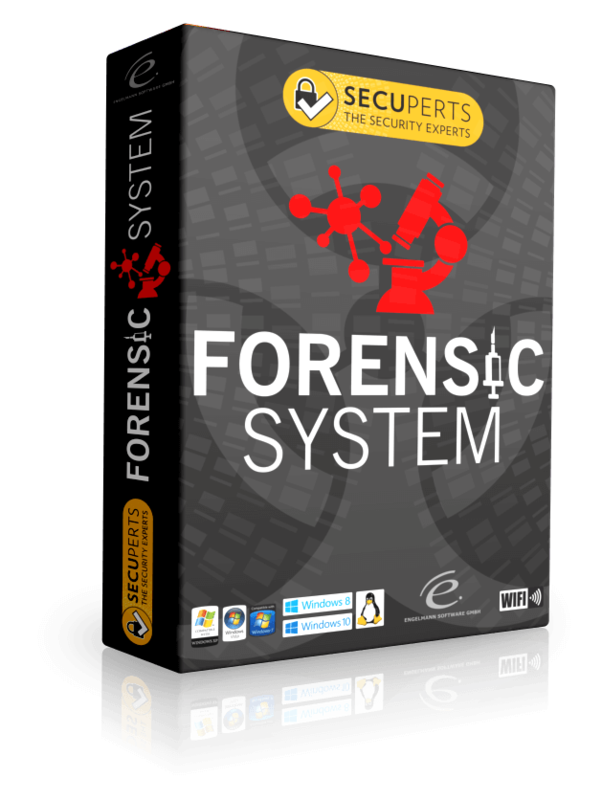 Get the SecuPerts Forensic System. All functions are available with no restrictions. We recommend you buy the software on USB 3.0 stick! I can't believe the amount of stuff that my television sends! Now I've blocked it all! My webcams were all totally unprotected online. Thanks for the great software! I finally feel safe selling my old outdated hardware. 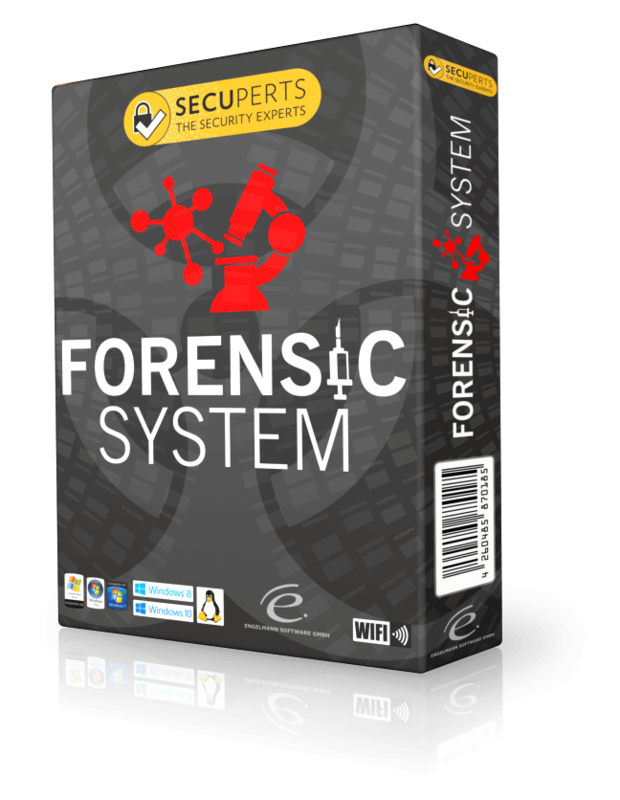 Buy now the SecuPerts Forensic System! Available as Download or on a USB-Stick!! If you wish to save something (e.g. log files or passwords), this backup should always be made on a separate data storage device. If you are launching our software from a DVD, you need an external USB hard drive, for example. If you are starting our software from a USB stick, the rest of the free space on the USB stick itself is retained for data. The Forensic System takes up approx. 10 GB of space on a USB stick. So a 16 GB USB stick provides more than 6 GB of available space. We therefore recommend acquiring the Forensic System on a USB 3.0 stick.